One of a series of distorted Wibbly Wobbly worlds. All art contains a degree of distortion (otherwise it may as well be a photograph). The difficulty with this type of picture is to ensure that you tread a fine line between distortion and the image becoming too much like a cartoon. I wanted to distil all the qualities that appeal to me (and hopefully others) in an average Cornish fishing village. The quirky higgledy piggledy houses, cobbled streets, ochre coloured roofs and the bumpy whitewashed walls. The attention to detail and realistic painting technique saves this work from being a cartoon, however, hopefully it still contains some of the more positive qualities of a cartoon such as being child (and adult) friendly, evoking childhood memories, pleasant and inclusive. 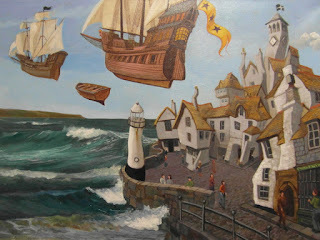 While painting the sea I was thinking of flying fish and I decided the way to catch them would be with a flying boat, hence the flying boats. 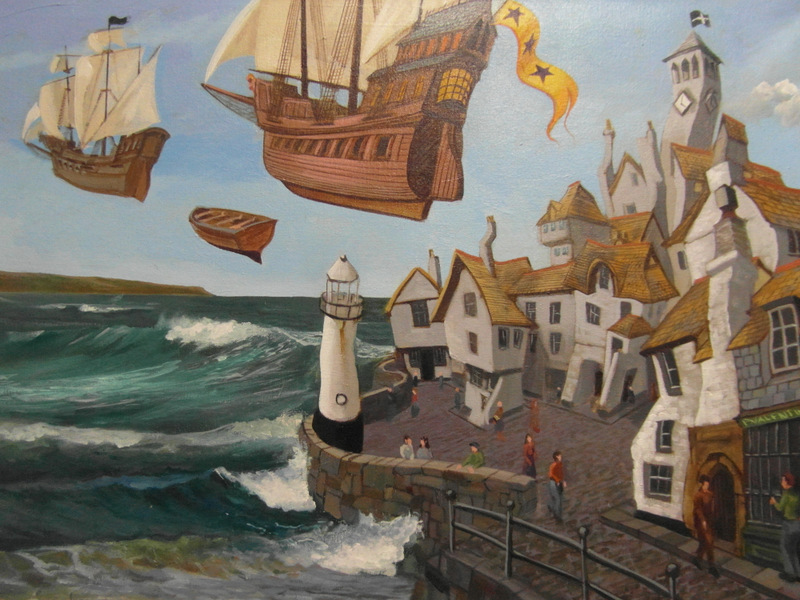 These flying boats also add a dream like feel to the picture giving it a surreal as well as a fantasy dimension. Although I grew up in Liverpool I was born and spent my early years in Chester. Very early memories and perceptions have a profound and life long effect. 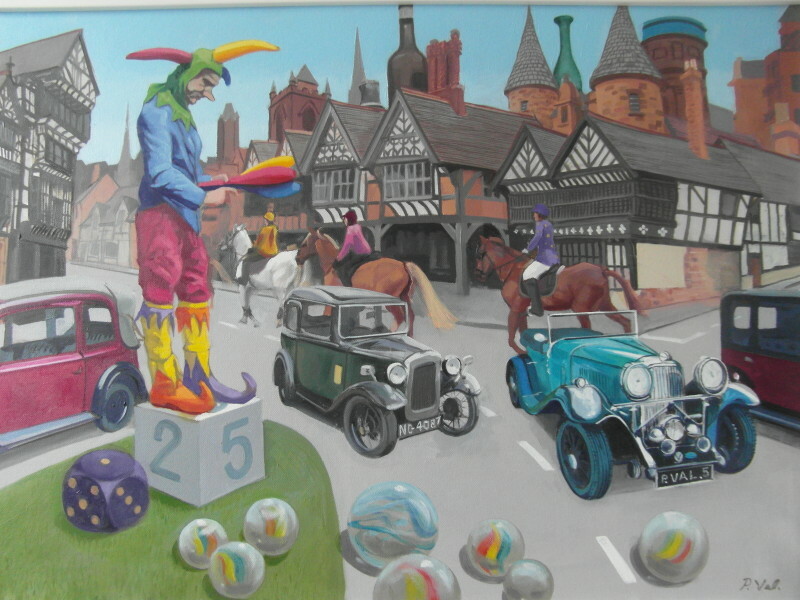 All of the buildings in this painting are in Chester but not next to their actual neighbours, liberties have been taken with placement to enable me to capture the juxtaposed perceptions of a young child. As a child I was fascinated with marbles, but not the game, rather the actual marbles themselves. I saw them as worlds and I would look into their swirling centres and let my imagination run riot, like gazing in to a crystal ball or a 3D ink blot. The cars identify a rough time line as I was in Chester in the late forties and very early fifties and cars at the time looked a bit like these. The horses probably came to mind because of the Chester races. The jester is, I suspect, me in a different time line juggling with life’s problems. My painting technique is a traditional oil painting method. Composition and subject drawn loosely in paint, followed by an underpainting in slightly darker than mid tone, then the darks, then the lights, and finally the highlights. From the general to the particular and the large to the small.